I’d love for my fitness program to become your new healthy habit! Call or email now to reserve your spot. 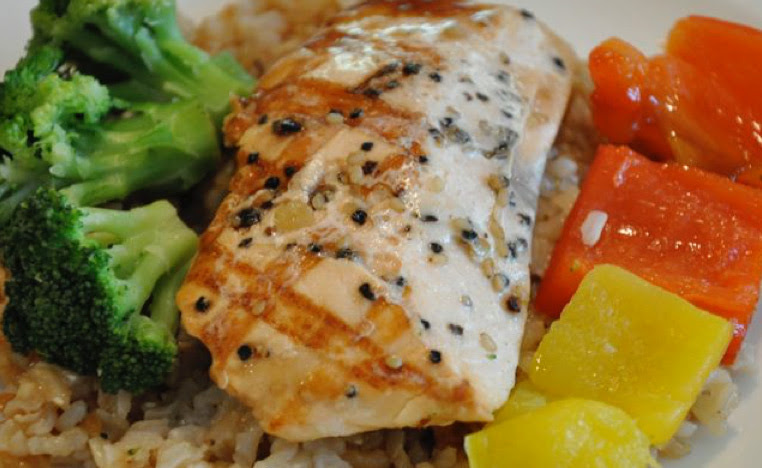 Salmon is filled with healthy omega 3 essential fatty acids, protein, and vitamin B12. This recipe is quick and tastes amazing. Serve it with a side of steamed veggies. 1. In a large re-sealable plastic bag combine the first six ingredients; mix well. 2. Set aside 1/2 cup of marinade and refrigerate. 3. Add salmon to remaining marinade, cover and refrigerate for 1-1/2 hours, turning once. Drain and discard marinade. 4. Place the salmon on a broiler pan. Broil 3-4 in. from the heat for 5 minutes. Brush with reserved marinade; turn and broil for 5 minutes or until fish flakes easily with a fork. Brush with remaining marinade. One serving equals 392 calories, 19g fat, 2g carbohydrate, 1g fiber, and 38g protein. Did you hear about the Magic Fat Loss Pills? I hate to break it to you, but there’s no such thing as magic fat loss pills. Well, they are right—proper diet and exercise will cause you to lose weight—without the costly bogus pills.